Life is never dull with fragrant herbs around you, and a carefully crafted arsenal of botanicals invites nature to play an important role in your health and well-being. In her magnum opus The Language of Plants, medical herbalist Julia Graves said this: "We have to imagine countless generations of shepherds, spending their entire lives in nature under the open skies—billions of lifetimes' worth of observations of what the animals nibble, what makes them sick and what cures them. The folkloric names of plants carry encoded in them the wisdom of this unbroken stream of oral transmission of native wisdom." In this universal language of wisdom, we can interact directly with the primordial experience of being part of the earth's cycle and plants' innate healing abilities. 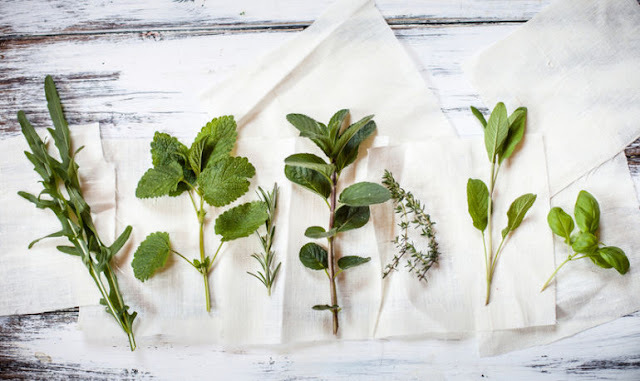 Think of these five herbs as a way to be your own modern alchemist, and use them as bountiful resources that are alive and brimming with energy to make you feel amazing! A member of the mint family, sage is a known memory enhancer and may protect the brain against certain processes that lead to Alzheimer's. It may work by protecting acetylcholine, a chemical messenger in the brain that's critical to memory. In a British study, healthy young adults performed better on word recall tests after taking sage-oil capsules. How to use it: Add to tomato sauce, butternut squash, or steep 2 teaspoons dried sage in just-boiled water for a strong cup of tea that provides a therapeutic dose. This herb is more than just an aromatic spice. Rosemary has also been traditionally used to improve memory. Science backs this tradition since like Ginkgo biloba, rosemary has been shown among laboratories to have antioxidant properties that neutralize free radicals. The Department of Psychology, School of Life Sciences, at Northumbria University, found that when rosemary is inhaled and eaten, cognitive function increases. How to use it: Rosemary goes well with just about anything: vegan frittatas, creamy mushroom-pea risotto, mixed with thyme to make crackers, and as a morning tea to substitute for caffeinated beverages. Known for its antispasmodic, antibacterial, anti-cancer, and sedative effects, periwinkle also makes a great herb that enhances memory. Its seeds and leaves actually contain vincamine, which is considered as a precursor to vinpocetine, a blood thinner that improves circulation of blood to the brain and promotes better oxygen use. Today, this chemical is widely used to enhance memory naturally. In fact, vinpocetine is one of the most potent ingredients found in many pharmaceutical products for Alzheimer's disease and dementia. How to use it: A cup of periwinkle tea is sky-high in alkaloids—calming, muscle-relaxing, and virus-fighting mega compounds. Pour a teaspoon of periwinkle leaves into a cup full of boiling water and let steep for 5 to 10 minutes. Once steeping is done, strain to remove the herbs. The tea can be bitter, so add a teaspoon of raw honey to sweeten. The lush leaves of this tasty plant are deliciously pungent—the scent alone goads the brain into a flurry of focused ability. The next time you feel stressed, have a cup of holy basil tea. It's been shown to increase blood flow to the brain, improving both mood and memory. How to use it: Make pesto with it, stir-fry it into Thai dishes, nibble on its raw leaves, or blend it with crushed strawberries and pour into ice trays for delicious cubes that will brighten up any glass of water. Studies have found that this herb actually helps to regenerate brain cells and improves memory. As far as its brain regenerative properties, Ginkgo can stimulate BDNF, a protein found in the brain and in the peripheral nervous system that is essential in the regulation, growth, and survival of brain cells—especially important for long-term memory. How to use it: Bring 2 cups of water to a boil. Add 1 ounce of Ginkgo biloba leaves; let steep for 10 minutes. Strain and serve.